← … And now let me share mine! What I know about myself is that I am immersed in this search for connection, a feeling of true belonging to my community and neighborhood. In my everyday work, I teach of the values of connection, community and inclusion. Yet, in my own neighborhood, it is clear that I lack these things. So I suppose this will out myself a bit, but alas, this is a place of learning and sharing. I’ve begun the process of getting to know my neighbors. This is an intentional shift in my thoughts and actions. It is the foundation for a practice of neighboring I hope to live everyday, the rest of my life. 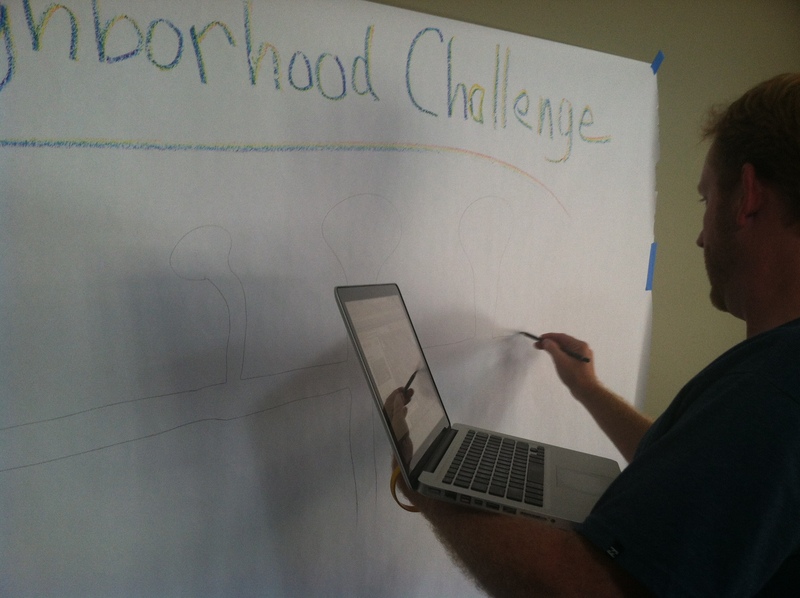 In these beginning days and weeks, I am being guided by a project called the Neighbor Challenge. Valisha Reber, an assistant with the Communities First Association, is facilitating this Neighbor Challenge via the Abundant Community website, http://www.abundantcommunity.com. 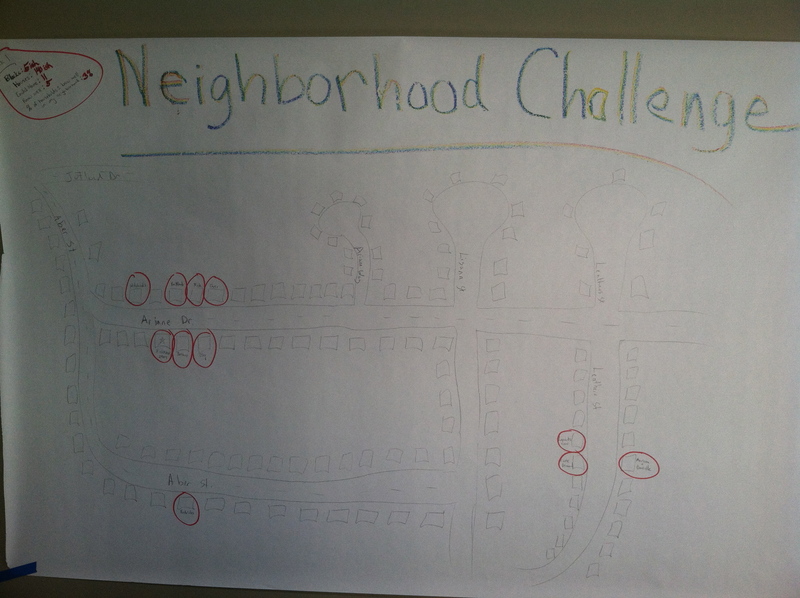 Valisha’s Neighbor Challenge provides some guidance on how to get started with meeting your neighbors, as she is posting about her progress week to week. I am following along, and encourage you to do the same. We won’t be posting about this Neighbor Challenge weekly, but I’ll check back in from time to time. As I drew the surrounding blocks in my neighborhood (as per the Week 1 instructions) realizations bounced around my brain and anxiety crept in. Upon completing the grid, with all houses represented with boxes, I wrote in the name of the houses of neighbors I know. I then identified the households and people that I actually know well. The numbers are staggering. Out of 140 houses on the grid, about 5 blocks of intertwined streets and col de sacs, I know the people who occupy 11 households. Out of these 11 households, I would say that 5 of them I know very well. The outcome of this first week of the neighbor challenge is the realization that I only know 3 percent of the people who live in my neighborhood, very well. After processing this activity, I was overwhelmed with a sense of excitement. You would think I may have been depressed upon the realization that I hardly know my neighbors, but really, I’m excited! I’ve begun a process of learning and knowing what needs to be done. I already love my neighborhood. I say it almost daily, just ask my wife. I have a real sense of where I need to go, and it’s next door! And then, next door to them, and then next door to them. Rather than looking at it as daunting or impossible, I’m choosing to simplify it. There is no time table. It is simply going to be small invitations, conversations and sharing of stories, one household at a time. I can’t wait to meet all the people who live in my neighborhood and connect with them in such a way that it is meaningful. I look forward to meeting people who may be just as excited as I am to turn our neighborhood into a place of abundant connection. Take a look at your own neighborhood and think about how many people you know. Perhaps you can begin this Neighbor Challenge as well? 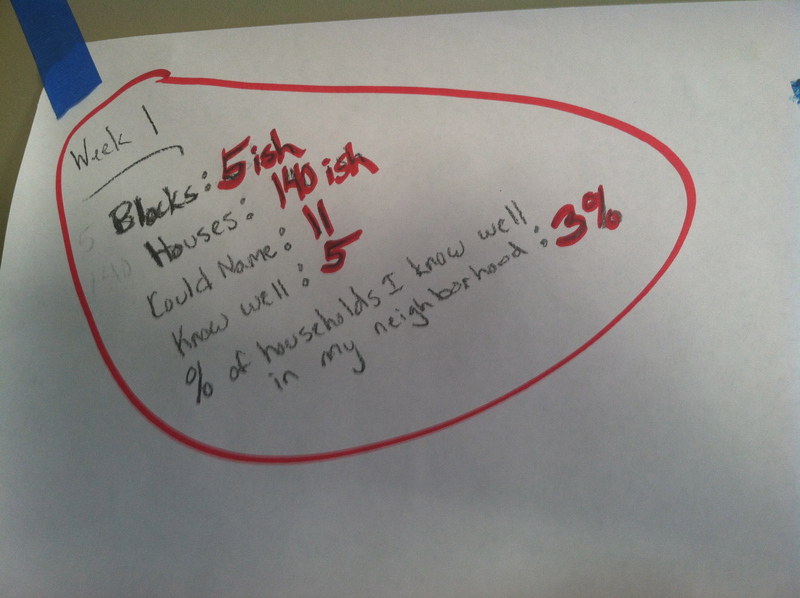 So I only really know well, 3 percent of the households in my neighborhood. Small number, sure…but it’s a start! Great, Kirk! Having a loved-one who desperately needed community forced me to do exactly this process for the past several years. I had to overcome many pre-conconceived notions about what my neighbors might be like, overlook their appearances and pasts (hence, learn about my prejudices), and embrace them and their differences. What I’ve gotten from this process is an amazing web of new friends and supporters, people who ask about my brother, people who stop in to visit my brother, and people who are there whenever we need help. Likewise, my neighbors know that they can come to me if they are ever in need. Creating community bestows gifts on everybody. Thanks Diana. I am sooooo looking forward to uncovering the gifts and capacities of my neighbors. Thanks for supporting us and this blog and for being a good friend. brilliant way of breaking down what can seem insurmountable. congratulations on knowing 3 percent! that may be higher than the national average…..thanks for the clear how-to. as we are about to move again, i’m excited to have your blueprint as a guide and i look forward to hearing more! Thanks Eileen! Out of curiosity, how did you find our blog? One way I’ve learned to get to know my neighbors, purely by accident, is by having cats! Animal lovers usually tend to be approachable and open about their fur-babies and sharing stories about them is inevitable. In my case, trying to frantically locate Olive when he didn’t return home one day lead me directly to my neighbor’s doors and now they have a face and name to my home and I have the same with them. In times of desperation I try to remember that a crisis can also mean opportunity. I value your effort to connect your ‘hood and hope to be more actively mindful about my own. I met 3 new neighbors this morning while helping to search for a lost Dachshund this morning. Frankie, the wiener dog (tee hee) is safe and sound in his new home. Love the positivity of 3 percent being viewed as a good start. Thank you for reminding me that your results don’t have to be ‘good’, what’s important is starting. And keeping on going. I’m on the same mission as you Kirk. We have a very close relationship with neighbours from two households over the side and back fence, and emerging relationships with five others who are neighbours of neighbours or down the street a little further. I’ve noticed that it can be hard and slow work. The best tips I’ve found so far and have used successfully are these: 1) Get outside of your house and into the front yard or plant and tend a garden at the front of your house where people are likely to see you often so there is a chance to say hello, 2) Invite people over for a reason that is easy for them to say yes to (e.g. to see your new rose bush, to have some birthday cake, to take some free stuff you’re looking to offload, to pop in to your party, to borrow a book or CD) but that doesn’t ask for a big commitment too soon, 3) If you have small children, as I do, ask other parents and their children in the neigbourhood over to play or to the park, 4) Give away some kind of surplus stuff out the front of your place and hang out nearby so you can confirm the stuff is for free, and so you can say hello, 5) Walk a dog or walk with small children around the block when you have noticed other people you are keen to bump in to also go walking, 6) Go to Garage Sales (Yard Sales?) that are happening in your block, 7) Hold a Garage Sale yourself, 8) Go to as many local events as you can, 9) Help out with keeping the block tidy by picking up rubbish and pulling weeds, 10) Find out when important events are taking place in people’s lives and bring them muffins, or extra toilet paper, or whatever else might be helpful but not too weird. I’m sure there are many more, and I’m looking for more, so feel free to keep them coming Kirk!!! Great suggestions Sarah!! I look forward to this process. Thanks for sharing. Again, this blog has the best reminders for how we all should live. I look forward to next Monday’s post! Those are great points Sarah Forbes! In the same vein, one thing I’ve found so helpful is to just do those little things that make meeting people possible, then go from there… then I like to celebrate neighbors to each other. It’s funny how serendipitous things start happening to me when I open up to relationship-building, like the other day a finally saw a neighbor who’s never out, but is a friend of mine, walking with her son who I haven’t seen since he was tiny! I started telling her about how I met my neighbor Anisley and since we were walking right by, maybe we could stop and say Hi. At that EXACT moment, I got a text from… Anisley! Asking what I was up to. So we stopped by, and now Anisley knows my friend AND her son. 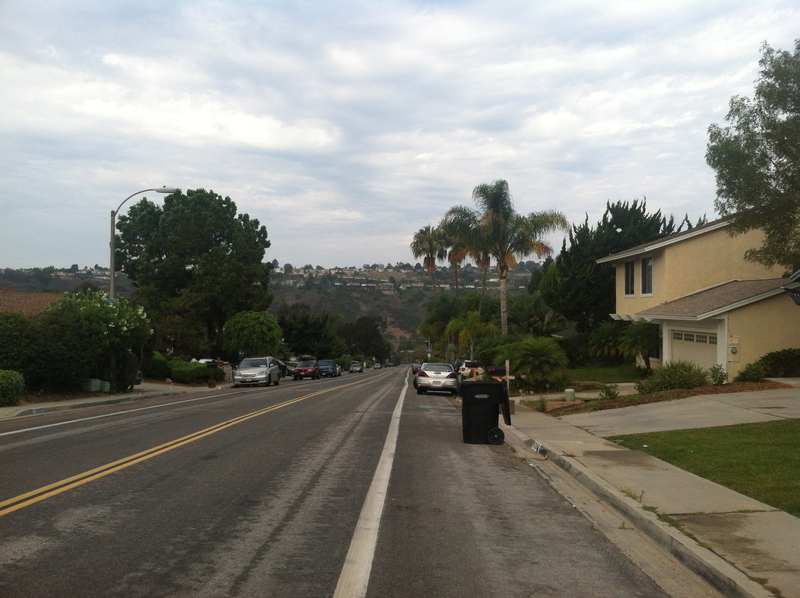 Today, by choosing to walk to a meeting instead of drive, I learned that another neighbor, Wayne, who I just met, gave up his car recently to drive a scooter or walk. So cool! I also decided to stop by this Peruvian Restaurant whose owners I’ve met just to say hi… we caught up and I learned they’re going to start having dancing out back come season. Which made me think of another neighbor, Albert, who teaches tango nearby and would be a perfect person to involve… once you start it just gets more and more fun! Look forward to sharing this journey with you Kirk. I still gotta do MY map!